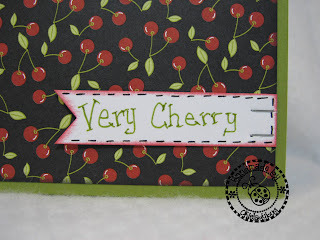 Okieladybug's Scrap N' More: Can't get enough cherries! You guys know I love my cherries! About a month ago I wanted to make something and couldn't think of what to make and looked up a "map" on Pagemaps.com to use. I used the Stampin Up Tart N Tangy cherry stamp. If you are one of my facebook friends you probably recognize the card since I did add a picture there after I made it. But just pretend this is the first time you are seeing it! I used a scallop edge punch on the green paper, I believe it is the Fiskars Apron punch or something like that. I used a 2 3/8" and 2" scallop circle punch to punch blue paper for the double layer look. I also punched a piece of cardstock to put in the middle to add extra pop to the image. I believe the cherries were punched with a 1 3/4" circle punch. 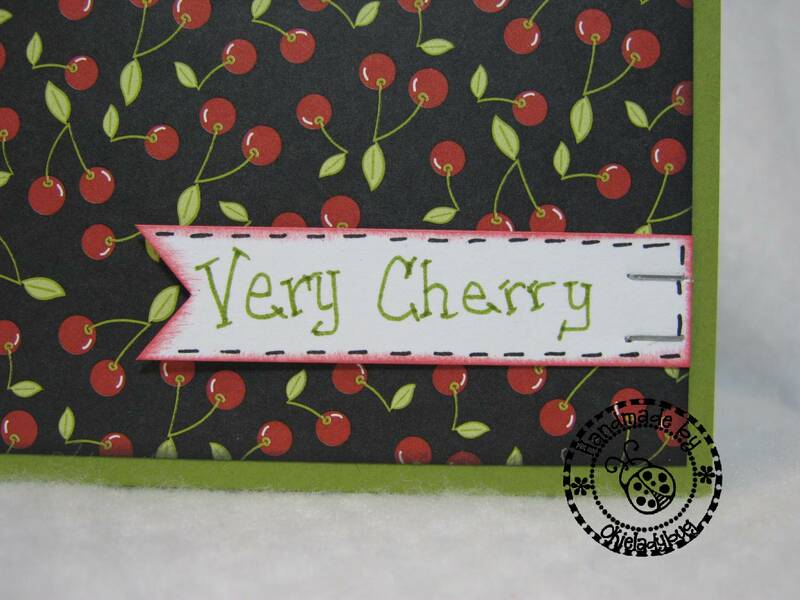 Here on the close up of the cherries you can see the glitter a bit better. I used the Quickie Glue pen to fill in the area and then sprinkled with Doodlebug glitter. 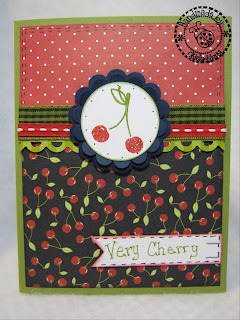 Oh the cherries were colored with Stampin Up Real Red and Old Olive. I dotted around the circle with the black Stampin Up marker. You can also see the double layer of ribbon I used and I think both ribbons worked well with the card. I did something on the sentiment I rarely do...I wrote it by hand! *okie gasps* I can't stand my handwriting and I would venture to say I have the absolute worst handwriting in the world. Oh sure I can make it presentable if I take my time, but I don't want to take my time! 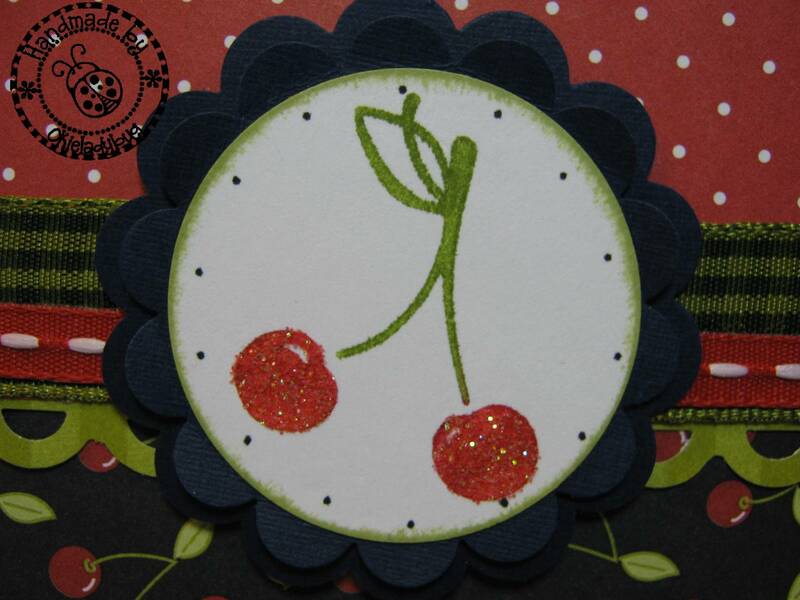 I used the Tim Holtz Tiny Attacher to add the sentiment to the front of the card. I won the Tiny Attacher at the last Swarm I went to in Norman and I was really excited to win it! Of course Tim Holtz excites me...er, I mean anything from the Tim Holtz products line, yeah that's what I mean! But either way ... 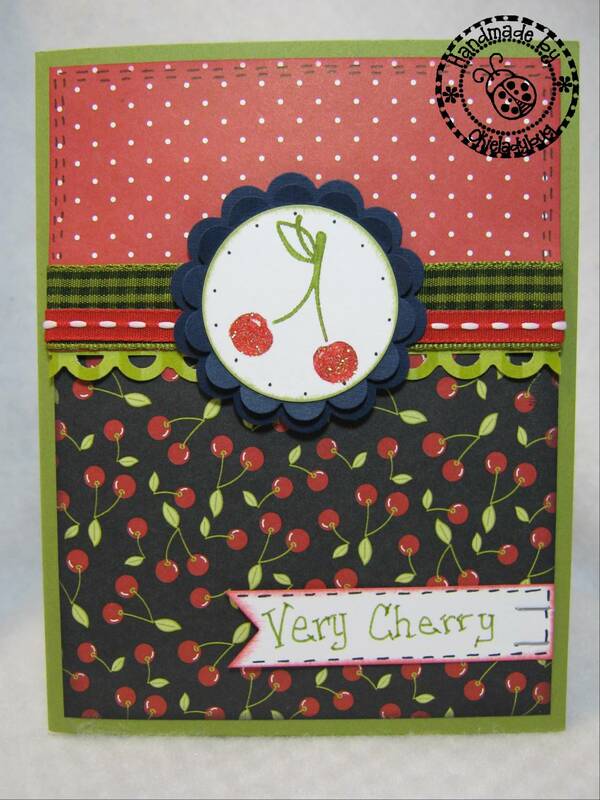 I really love the card ... Cherries are a fav of mine too! Beautiful, I love cherries! and I really like the way you layered the ribbons. OK Okie! I have the same paper hoarding problem! By the way, that paper is a favorite of mine as well, it is called Rockabilly! So back to the hoarding problem, STOP it! I read on someones blog a while back that we need to use our supplies when we get them because we move on to new favorites and don't like the old favorites as much. It is true, I LOVED that paper when I got it so I never used it. I still like a lot, but not as much as I did when I got it, I moved on! Does that help? Think about it and you know it is true. Anyway, I love the card, you and your blog and your amazing humor! You are absolutely correct - we papercrafters can be a bit obsessive about our paper. So we collect instead of use. Weird huh! Thanks for the happy cherries today. Sweet card! So were do you have TH's picture?